Master & Dynamic has always drawn on its hometown when designing its growing product line. Today, the brand unveiled a new colorway inspired by one of the city’s newest gems: a large-scale mosaic self-portrait by Chuck Close at the recently unveiled Second Avenue subway. The silver metal, navy leather MW60 Wireless Over-Ear Headphones, which reflect the stunning navy blue used in the mosaic tile, are available for $549 at www.masterdynamic.com. Just as the subway is an integral part of travelling around New York City, so too are the MW60s. The ultimate wireless thinking cap is perfect for use both on the go and in the comfort of home, with the stunning silver/navy colorway presenting a fourth chic hue for users looking to align their sound tool with their lifestyle. Opened January 1, 2017 to much fanfare, the Second Avenue Subway features 12 large-scale portraits – 10 mosaics and two tile works – by Chuck Close, placed at the 86th Street station entrances and mezzanine concourse. The subjects include famed cultural figures such as the late musician Lou Reed, composer Philip Glass, painter Kara Walker, artist Zhang Huan, and more, as well as two self-portraits, all based on the artist’s photo-based portrait paintings. A Chuck Close Phil/Fingerprint screenprint of Philip Glass has hung in the Master & Dynamic offices since the company’s inception in 2014. 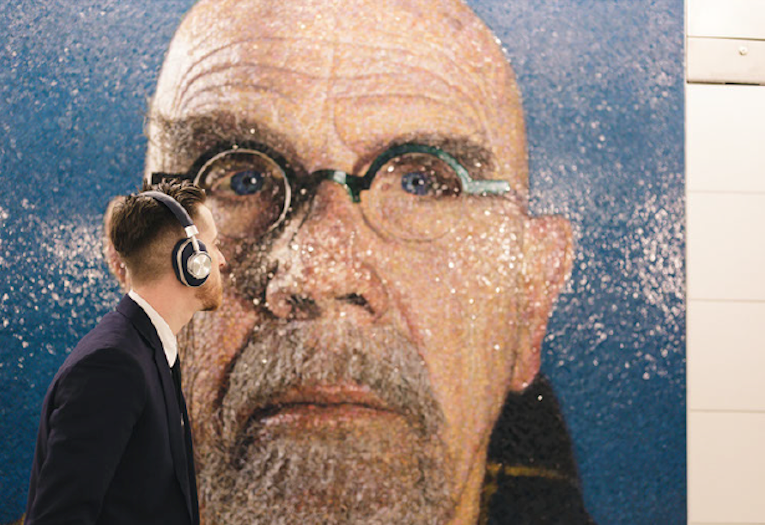 Upon discovering that a series of Chuck Close portraits had been commissioned for the new subway line, the team at Master & Dynamic became transfixed by the self-portrait’s brilliant blue eyes and background. This stunning tile mosaic ultimately served as inspiration for the latest MW60 colorway. The MW60 also accommodates multi-point connection and features a 15-hour lithium ion rechargeable battery, which, much like the product’s silver/navy, silver/brown, gunmetal/black and black/black colorways, give the user a multitude of useful options.